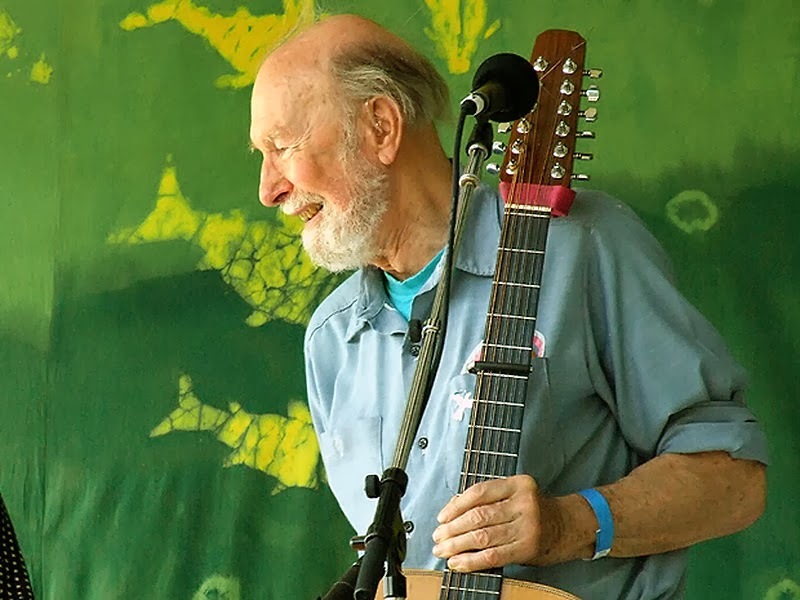 To me Pete Seeger was his stepmother’s stepson. Ruth, he called her—her own children called her Dio—and I liked the warm way he said her name, sometimes as in “Father and Ruth.” Of course I listened to Pete as a Weaver. I used to think of him as a folk Orpheus, particularly in those photos where he lifted up his voice to the sky. His eyes looked upward too, as if the heavens were telling him what to sing and how to carry on. His banjo was his rod and staff. But I met him and talked with him and wanted information from him ranging from fact to revelation in this most peculiar role of biographer-of-a-relative. Photographed at the Clearwater Festival 2007 by Anthony Pepitone. Looking back at him, I remember him as a tall austere figure, typically dressed in blue jeans and looking not exactly “poor,” but resistant: clothes meant image and image meant capitalism and inauthenticity. On a very hot beach day one summer, I talked to Pete and Toshi, who were in town for a concert at Salem State Teachers College. They had been put up in a dorm room, an airless cubicle made out of concrete blocks. So much for star treatment, I thought. I brought with me his father’s FOIA (Freedom of Information Act) report I had obtained from the FBI. It more or less showed how Charles Seeger’s involvement with Hanns Eisler, an East German composer and brother of a politically convicted Communist “spy,” Gerhart Eisler, had finished off Charlie’s career at the Pan American Union. “It wasn’t you!” Toshi exclaimed to him. Pete was lying on the bed against the wall, reading the heavily redacted report. He looked at me with pain in his eyes. He said nothing. When I asked him a question about his “career,” Toshi snorted, “what ‘career’? He doesn’t have a career. He has jobs.” Slam went the door. I said nothing. Later he remarked on how Seeger men always ask too much from their women, more than they can give. In 2004 Ellie Hisama and Ray Allen produced a centennial festival celebrating “Ruth Crawford Seeger. Modernity, Tradition, and the Making of American Music,” through the Institute for Studies in American Music at Brooklyn College on October 26–27, 2001. Everybody was there, forming a Venn diagram of her life. Now it reminds me of a wedding with the bride’s family on one side and the groom’s on the other. The folk crowd who loved folk music and the modernist crowd who loved classical music sat together in the same room and made music together and discovered or reaffirmed their shared legacy. I felt the vibrations of a family in the making among people who didn’t know how much they had in common. Pete, Peggy, and Mike gave a tribute concert. We all sang folk songs, and we heard performances of Ruth Crawford Seeger’s dissonant counterpoint, its integrity and hope cutting through the smoke still rising from the fallen buildings of the World Trade Center. Pete and I sat on stage for a panel discussion. His body language and mine reminded me of Dio and Charlie’s aesthetic mantra: “sounding together while sounding apart.” Suddenly he turned to me and with great intensity, reached over, and shook my hand. He said nothing and neither did I.
Judith Tick is author of Ruth Crawford Seeger: A Composer's Search for American Music (Oxford UP, 1997). She is the Matthews Distinguished University Professor of Music History at Northeastern University in Boston and an Honorary Member of the American Musicological Society. She was recognized by the Society for American Music with its Lifetime Achievement Award in 2013; additionally a permanent research endowment, the Judith Tick Fellowship, was established in her honor by SAM and first awarded in 2013. 20 Feet From Stardom: Entertainment or History?